Senator Barack Obama appeared in David Letterman's hot seat last night -- and cleared up the "lipstick on a pig" comment that has caused so much controversy. "It's a common expression in at least Illinois," said Obama on "Late Show with David Letterman." The Senator emphasized that his use of "lipstick on a pig" referenced what he considered McCain's faulty policy ideas -- and the GOP trying to pass them off as change. 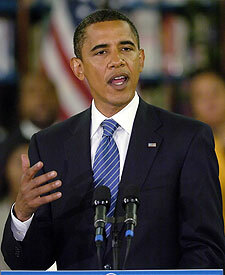 "Just calling [ideas] change, calling them different doesn't make it better, hence lipstick on a pig," said Obama. "I had meant it this way; [Palin] would be the lipstick. The failed policies of John McCain would be the pig, just following the logic of this illogical situation." The presidential hopeful also dismissed rumors that Bill Clinton would be part of an Obama cabinet -- but became excited when the possibility of the former prez campaigning for him came up. "There's nobody smarter in politics," said Barack. "I think he can be a great advocate for the campaign." 'Lipstick on a Pig': OId Saying or Palin Poke? Obama to Palin: Let's Shoot Some Hoops! Click on an image to view the POLITICALLY ACTIVE STARS photo gallery!